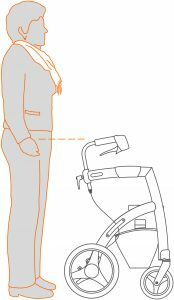 Setting the right height of your rollator should be one of the first things to consider before you start using the mobility aid. It is important to adjust the handles correctly to ensure good posture while walking. This is the first in a series of six lessons on how to correctly use a rollator indoors. We recommend to do this along with someone else, who can oversee if you are standing in a proper position. 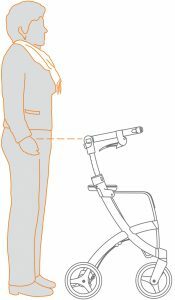 Stand upright, as close as possible to the rollator. Let the arms hang down, relaxed. Adjust the handles to wrist level. Set both handles at the same height. When you grip the handles, the arms must be slightly bent. Has the correct height been determined? Then remember the position so that you can immediately set it again if necessary. The video below shows how to set the height of your rollator. Adjustments that are too high are not comfortable while walking as it requires more strength to support yourself, and can also strain your neck. When the adjustment is too high, the elbows may either bend at an uncomfortable angle or be stretched out too much. If streched out, the shoulders raise up too high and therefore put strain on the neck muscles, which can lead to neck pain. All of this can be prevented by placing the handles at the correct height. If the handles are too low, this may cause you to walk too far away from the rollator and therefore not have the needed walking support. “I often see people walking with a rollator that is set too high, even though it had been set at the right level in the store or by the physical therapist. People within the environment of the user, for example an overly enthusiastic son-in-law, think ‘the higher, the better, otherwise mom walks bended over the rollator’. Next lesson: Walking with a rollator. Rollz rollators are unique. Turn your Rollz Motion into a wheelchair/transporter with a flick of the wrist. The Rollz Flex is the perfect companion to go out and about. It is a certified rollator but looks like anything but one! Rollz rollators are easy to use, offer stability and keep you moving.